The New Year is a time for new beginnings and on that note, I bring to you my first post of 2008 - Chocolate Balsamic Truffles. I tried my hand at making truffles yesterday. I was inspired by Giada’s recipe that I saw on Everyday Italian. The process is a little time-consuming, not to mention messy, and I quickly realized that they weren't as easy to make as they had seemed when I had first watched the segment on her show. I was however, pleased with the way they turned out and the end result was definitely well worth the effort. The truffles tasted absolutely heavenly and simply melt in your mouth. I’ve tweaked the original recipe a bit and this is how I did it. Cut the chocolate blocks into small, even pieces (this helps melting it uniformly easier) and place in a microwave- safe bowl. Heat the heavy cream in a pan till small bubbles begin to form along the edges and it almost starts to boil. Add the balsamic vinegar and mix well. Cool the ganache completely, cover and let it sit in the refrigerator for an hour or two till it is firm and has set. Roll each truffle around in your chosen topping. I made three kinds -some with a dusting of cocoa, some with a coating of coarsely ground and toasted walnuts and some others covered with lightly toasted coconut flakes. I don’t think that these can be stored for a very long time, but I have read in a couple of places that they will keep well for at least 2-3 weeks if refrigerated and stored in an airtight container. Let the truffles return to room temperature before serving. I don’t expect my truffles to last long enough for their shelf life to be a concern! This is going to Deepz at Letz Cook for JFI - Chocolate and to Bindiya who blogs at In Love with Food, for her chocolate fest. Before I forget, I would like to thank Jaden and Hari Nayak for my personally signed copy of the cookbook “Modern Indian Cooking”. It is a beautiful book with stunning pictures and some great recipes by Hari Nayak and Vikas Khanna. I am looking forward to trying out a couple of recipes from here in the coming months. Thanks once again! Here's wishing all my blog buddies a very happy and prosperous 2008! ms. giada junior ;)..the truffles look really really good..
the balsamic is a great touch. happy new year. Balsamic vinegar and dark chocolate and cream! What an inspired idea. Thanks for sharing this recipe. I'll be making this soon. That's great that you made truffles too! 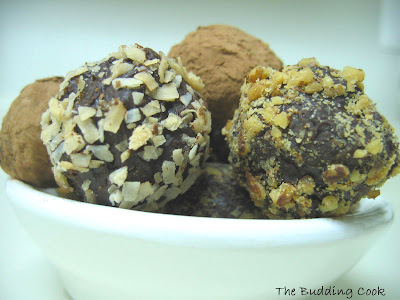 They are just so tasty, but I think they stretch the truth when they say truffles are quick and easy to make. They are involved, but well worth it. Balsamic, huh? How did it show up flavor-wise? I think I cannot comment on chocolate dishes since I don't take them..
Beautiful truffles. You couldn't go wrong with chocolate, is what I say. Great flavor pairing, TBC, and a nice and easy entry into 2008. Good to see you posting again. Happy New Year, TBC! and I am also a big fan of Giada! those truffles looks promisingly delicious. they look very tempting tbc! 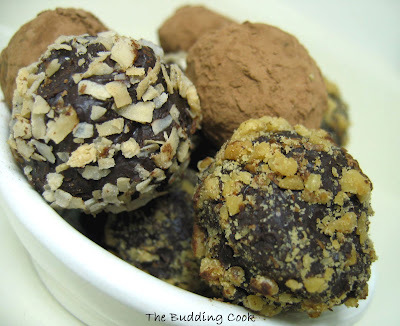 I love truffles and also like to make them. This recipe sounds quite good. Happy New Year! Happy New Year TBC. Those chocolate truffles looks yum. Love the truffles, I saw them too on her show. Now that is what I call real harwork. It looks tasty. Was the smell of balsamic vinegar strong? TBC, lovely truffles never heard of adding Balsamic vinegar.Great start for the year. Happy New Year !!! whoooah! !I wanna pop one in my mouth...whooah! !tooo tempting!!.. TBC,Thanks for such a divine entry! Rajitha, you say the nicest things!that's why I like you even more now;-). Bee- thanks and a very happy 2008 to u too. Bri-that's true...it was not as easy as it was made out to be.I think I've got the hang of it now. It should be a little easier the next time around. Padma- A very happy 2008 to u too. It's good to have u back. Happy 2008 yo u too! I will be cooking from the book soon. A very happy 2008 to u too! Helene- Happy 2008!. If u do make 'em do let me know. I see that u've been cooking up a storm! Shankari- Not at all...or maybe it was 'cos I did not use one of those super-expensive great brands. I used Progresso- my regular brand.I think I should use a little more the next time, even though the original recipe only called for 2 tsp and I used 3. Thanu- You are being very kind now! Your garlic chutney was delish! We had a great brunch- dosa with garlic chutney, coconut chutney, sambar & hot kapi.Thanks again... loved the chutney. Happy New Year to you and your loved ones, dear! What a lovely treat this is :). Can i have some, please :-D. The first line of your post actually is more appropriate for folks like me ;). Thanks for your note :). Hope you had a lovely time for the holidays. Balsamic vinegar is as gourmet and cutting-edge as this can get! Wow! Love the truffels. I am sure it was worth all that work you did . Congrats with your book. I saw in Sigs place that she too got one. Musical! where are u these days? We had a great holiday season. How have u been? You made truffles too for the first time? What a coincidence! I guess I was not that organized- which is kind of necessary- for this one! It was from one of Giada's recipes. Happy Cook- A very happy 2008 to u too:-)It was indeed a bit of work but I am happy I tried it. Thanks. The book is very special 'cos it's the first time ever that I won anything! So beautiful. If I make these I know my husband will be my slave for life! Thanks for sharing. OMG....TBC, for a moment I almost caved in from my new year resolution. Truffles look damn good. I got to go away from this page right away dear. This is soooooo tempting and I can't handle it anymore. Thanks so much, looks excellent, am going to try them. Just FYI - 3 teaspoons = 1 Tablespoon, at least in the USA. i came across giada's video today and i'll probably make some of these for my husband to give away to his friends at work. I swear by all of Giada's recipes... they're the best! Yum! I fixed these today (with just a touch more Basalmic more by accident than design) and the ganache is just killer delicious! Sasha- thank you for visiting! Balsamic vinegar and chocolate go so well together, don't they?